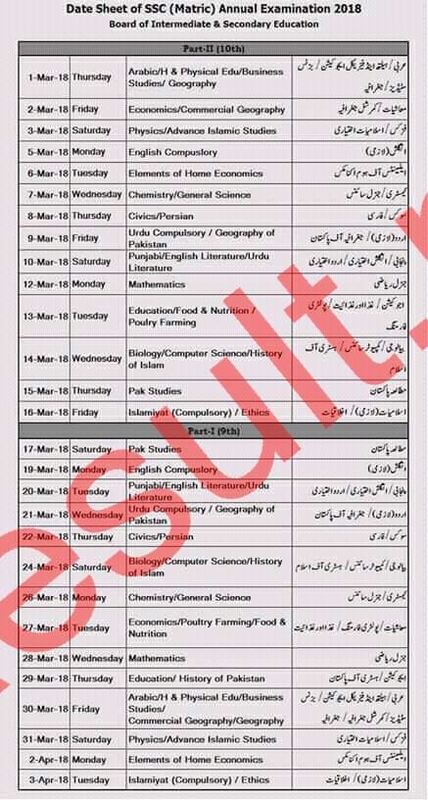 Lahore Board issues the roll number slips and date sheets to the candidates of SSC and HSSC classes few days earlier. Now BISE Lahore Board has already received the admission forms from the candidates of matric and FA/FSc classes, but their roll number slips and date sheets for the annual exams for 2018 2019 have not been issued till now. It is expected that Lahore Board will start the annual exams of matric class part 1 and 2 for the year 2018 2019 from March. Similarly, it is expected that the annual exams of Inter part 1 and 2 will be started from May. It is routine of BISE Lahore Board that it announces the date sheet and the roll number slips of the students one month earlier for the facility of the students. So the students of matric class wait for their date sheet till February and the students of Intermediate part 1 and 2 for the year 2018 2019 will wait for their date sheet till April 2018 2019. The candidates of SSC can get the date sheet from the official website of Lahore Board www.biselahore.com with complete information. The students of matric class will get latest updates of their date sheets from this page, so they should keep visiting this page to get the latest information regarding date sheet of 9th and 10th classes.